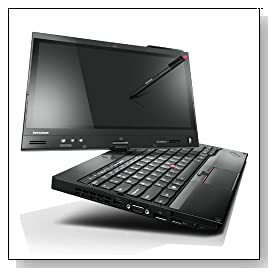 Lenovo ThinkPad X230 343524U is a 12.5 inch convertible touchscreen laptop with the fast performance and speed of its powerful Ivy Bridge Intel i7-3520M processor, Windows 7 Pro operating system, hard drive with higher- 7200rpm spindle speed and it is designed to be a great little business laptop with reliability, durability, productivity and impressive battery life for you to get more out of it, both as a tablet and a laptop. Lenovo ThinkPad X230 comes with a 3rd generation dual core Intel i7-3520M processor (4MB L2 cache) at 2.9 GHz speed that goes up to 3.6 GHz with turbo boost and hyper threading with two cores handling four threads in parallel to even better usage of the already powerful processor, 4GB DDR3 SDRAM at 1600MHz speed (PC3-12800) to multitask efficiently, 500GB Serial ATA/300 hard drive at 7200rpm rotating speed- quicker read and write times (and is designed to be easily replaceable) and the 64-bit Windows 7 Professional which is still much preferred to Windows 8 by most computer users. You will get overall very responsive performance in usual daily Office, multimedia or internet tasks. 12.5 inches bright and colourful high definition anti-glare LED-backlit Active Matrix TFT Color LCD touchscreen display with 16:9 cinematic aspect ratio, 1366x768 pixel resolution with IPS- In Plane Switching technology which makes it easy to view the screen at various angles with up 178 degree viewing angle and the display quality is one of this machine’s strengths. Intel HD Graphics 4000 is not for advanced gaming but is surely quite a capable graphics card for a variety of other daily multimedia tasks, helped by the processing power of the i7-3520M CPU which makes the machine a little workhorse. Sound quality is rather good with the integrated HD Audio and stereo speakers and the 720p HD webcam with integrated microphone will make it easy to chat on Skype. Black Lenovo ThinkPad X230 weighs just under 4 pounds (3.97 lbs to be exact) with measurements of 12 x 9 x 1.23 inches- does look thicker than it actually is due to the large battery and rubber feet, and the battery life is reported to be up to around 9-10 hours from its 66 Wh 6-cell lithium ion battery. Keyboard with chiclet style keys is very comfortable to type on but has no separate numeric keypad due to the size of the machine but has a small trackpad and a red track point in the middle and you can use whichever feels more convenient. It doesn’t come with an optical drive and that helps with reduced weight, but a Centrino Advanced-N 6205 802.11a/b/g/n wireless, Bluetooth 4.0, Gigabit Ethernet with RJ-45 connectivity, a DisplayPort, a VGA port, 4-in-1 Card Reader (SD, SDHC, SDXC, MMC), Finger Print Reader, Audio Line Out, 1 x USB 2.0 port, 2 x USB 3.0 ports, 2 memory slots (on of them free) so you’re getting a decent range of connectivity options here. Conclusion: Lenovo ThinkPad X230 343524U is a powerful small laptop and tablet in one- convertible, with a superior screen with IPS for larger viewing angles despite not being Full HD and the backlit keyboard is is reported to feel really nice to type on, touchpad is a little small but it does have a trackpoint that you can use instead. The boot up time is reported to be a little long at up to 55 seconds according to one of the reviewers and this can be fixed by replacing the hard drive with a Solid State Drive and the screen bezel is also pointed out as a con by one of the reviewers, they would have liked it to feel a little sturdier- that you may notice some clicking in the bezel (we haven’t had the chance to have a look at the machine). 4GB RAM should be enough for most people for daily productivity and can be expanded to 16GB if needed. It is a powerful machine despite having a 3rd generation but a full-voltage CPU and the heat is dissipated by the large and and heat sink at the bottom- doesn’t really get warm generally speaking but will get warmer when you’re working on tougher tasks and the fan will spin faster. It comes with a battery stretch application that reduces the display brightness, decrease the processor speed etc. and you may want to use it in situations where you need to really extend the battery life. Last but not least it comes with a standard 3 year limited warranty by Lenovo.